Burial registers typically do not include a date of death, but in the vast majority of cases, this will have taken place within the previous few days. The majority of Church of England parish registers, and many non-conformist registers, are now held in the relevant county and borough record office. A good starting point for locating these is the National Archives' Discovery system. Many parish registers have been transcribed by family history societies and published in various formats such as booklet or CD — many of these are available from sources such as S&N Genealogy Supplies and the FFHS GENfair online store. It was the duty of the workhouse master to register all deaths within the workhouse within five days of their taking place. The master also kept his own register of deaths. Other workhouse registers such as the creed register, the admission/discharge register, and medical relief book would also record inmate deaths. From the 1880s, it became increasingly common for poor, but not destitute, persons to enter the workhouse purely for medical treatment in its infirmary. If such an individual died, their death would be recorded as being in the workhouse infirmary, although their family might well be living outside the workhouse. If an inmate died in the workhouse, the death was notified to their family who could, if they wished, organize a funeral themselves. If this did not happen, the Guardians arranged a burial in a local cemetery or burial ground — this was originally in the parish where the workhouse stood, but later rules allowed it to be the deceased's own parish. A few workhouses had their own burial ground on or adjacent to the workhouse site. The burial would be in the cheapest possible coffin and in an unmarked grave, into which several coffins might be placed on the same occasion. Under the terms of the 1832 Anatomy Act, bodies unclaimed for forty-eight hours could also be disposed of by donating them for use in medical research and training — this was not specific to workhouses, but applied to any institution whose inmates died while in its care. Depending on the site, such burials might feature in the relevant parish or cemetery records. Wandsworth Union death notice, 1924. 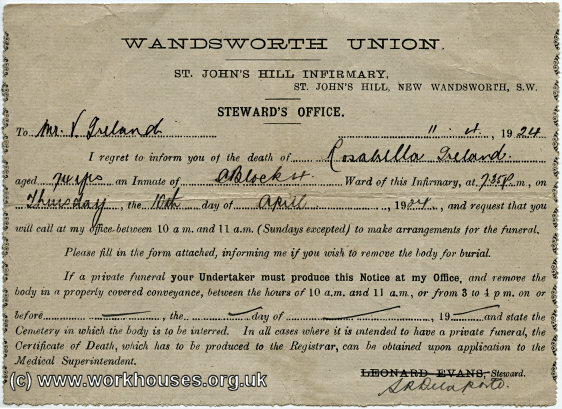 In 1904, in an attempt to remove the stigma of having been born in a workhouse, the Registrar General recommended that the registration of such events should not identify their location as being a workhouse. In 1918, this procedure was extended to workhouse deaths. Many of these addresses are listed on the separate addresses page. In 1921, Scotland followed a similar course and recorded what were referred to as 'substitute' addresses for births and deaths taking place in a poorhouse. Some websites which provide online versions of the death indexes also provide an online certificate ordering service. Some workhouse death and burial registers have been transcribed by family history societies and published in various formats such as booklet or CD — many of these are available from sources such as S&N Genealogy Supplies and the FFHS GENfair online store.